This is the gun I do not use to go hunting for rabbits. Trying to figure out how to do this hunting thing is far from simple; it's a complicated learning process and one that I'm still very much involved in. This gun, then, is a snapshot from an early understanding of what was needed to get a rabbit for the pot. 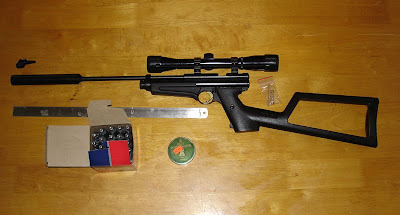 It's a modified Crosman 2250 Ratcatcher. These guns are economical to buy new and can be very cheap second hand: I picked this one up (minus the scope and sound moderator) for £70 via the Pigeon Watch Forum. This was a good deal because the gun was in fine condition and had been modified with the addition of a steel breech. Ratcatchers come from the factory with a plastic breech and, if you want to achieve any sort of stability for your scope you'll definitely need to discard this and get a steel breech with proper scope rails (the Ratty does come with a scope of sorts when it's new, but it's very close to being a purely comical addition and little use for anything other than backyard plinking). Since this breech work had been done and the gun was in sparkling condition I was delighted with it for £70. I picked up a second-hand scope from another online air-gun forum (£20 as I recall) a Nikko Sterling Silver Crown 4 X 32 (which seemed to me at the time perfectly adequate) and then a sound moderator from another forum (second-hand & made out of a high-tech plastic called "Delrin") for another £30. The Ratty runs on CO2 - little cartridges that you can buy at gun shops or online - and fires a .22 pellet at about 7.5ftlbs. Though it's worth saying that it fires at 7.5ftlbs in warm or mild weather - in cold weather the numbers will go down a great deal. I liked the Ratty: it was extraordinarily light and easy to carry - you could wander round the fields for hours with this thing on your shoulder and practically forget that it was there; with the scope set up it was accurate: after a good deal of practise I was getting good-enough groups at 30 yards to justify using the thing to hunt with. So start to hunt I did. And I got nothing. I couldn't hit a damn thing. And the reason? It's not about the gun, I learned, it's not about the gun. The finest, most ludicrously expensive, blinged, polished & smartly-equipped air rifle available (shooting under 12ftlbs as per the demands of the law) will, I eventually learned, get you absolutely bugger all for the pot if you don't know enough about the business of hunting itself. The Ratcatcher, if you can stalk and if you know about how to conduct yourself in the field whilst out after rabbits, will probably, at close range (that's to say up to 30 yards) almost certainly help you fill up the cook pot. But if you don't know how to stalk (I didn't and I still don't) then forget it. If you can't get very close, then it just doesn't have the poke for the job. I spent a few weeks getting this into my thick bonce and then bit the bullet and bought another gun.